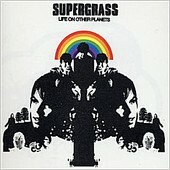 Supergrass is one of Britain's greatest bands. There's no doubt about that. However, it seems that the band has lost a bit of the zing that made their debut I Should Coco one of the best first records likely ever. Their two following records, 1997's In It For The Money and 1999's Supergrass, suffered from maturation and a lack of enthusiasm. Their new record, Life On Other Planets, unfortunately, endures the same problems. As always, Supergrass put their clown masks on, showing off their quirkiness in every spot they can, but even the best guitar riffs and most creative organ tickles can't save a lack of melody and imagination. Give them credit, their knack for digging up the past and delivering grooves that made Rod Stewart and T-Rex gods are hard at work and certainly getting the job done. Maybe it's the lack of a good single that hurts this record. "Never Done Nothing Like That Before" doesn't even feature frontman Gaz Coombes on lead vocals, which makes the song lack familiarity. "Grace" is fun and in good spirits, but would only have been a fifth single if it had been on their first record.